West of Hwy 400 on Mapleview Drive turn left on Bryne Drive. Traditional Rooms to Kitchenette Units. Featuring our Express Start Hot Breakfast Every Morning. For the comfort and amenities you deserve, reserve a room at the pet - friendly Holiday Inn Express Hotel & Suites of Barrie, Ontario. Our hotel is convenient to Highway 400 to keep you connected to the attractions and businesses of downtown Barrie. Lodging here puts you minutes from exciting attractions, like a Colts game at the Barrie Molson Centre or a shopping trip to the 400 Flee Market. For an exciting night out, you can visit the Slots at Georgian Downs; ask the hotel's front desk for your $10.00 Gaming Voucher and free gift from Georgian Downs OLG Slots. Are you traveling on business to Barrie, Ontario? Our hotel is convenient to many corporations, such as Mueller Canada Inc., Canplas Industries Ltd., Royal Victoria Hospital, Georgian College, YOM, Wolf Steel, and Can-Save. You are invited to use the computer and copy, fax and print services in the 24-hour Business Centre in our hotel's lobby. 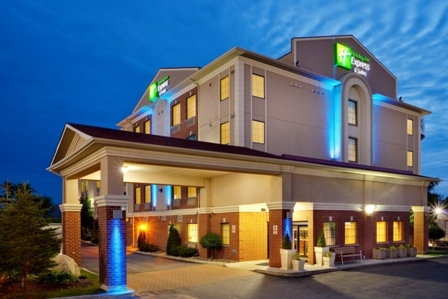 Barrie, Ontario's growing tourism calls for a versatile hotel like ours. We meet the needs of travelers by offering spacious rooms and with triple-sheeted bedding, microwaves, mini-fridges, and 37'' Flat screen TVs, work areas with free high-speed Internet access to keep you connected while traveling in Barrie. Our hotel's Fitness Centre, indoor pool and whirlpool ensure that you'll enjoy a relaxing stay.